If you have written regular expressions before, you know that the regex syntax can be hard to keep track of. Certainly when writing a regex pattern that uses plenty of grouping and alternation. RegexBuddy's regex building blocks make it much easier to define regular expressions. Instead of typing in regex tokens directly, just pick what you want from a descriptive menu. Use RegexBuddy's neatly organized tree of regex tokens to keep track of the pattern you have built so far. Collapse grouping tokens (with green icons) to get a clear overview of complex regular expressions. If you are already familiar with the regex syntax, you can edit the regex directly. RegexBuddy updates its regex tree as you type, and highlights the token that the text cursor points at. That way you can easily keep track of what you are doing, without losing the speed of directly typing in the regex pattern. 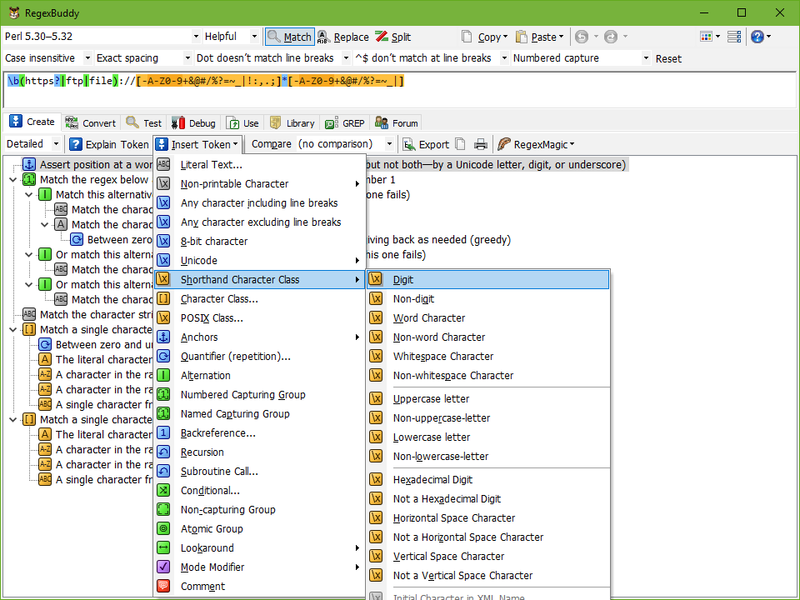 With RegexBuddy you can quickly and easily create and edit regular expressions. Mix manipulating RegexBuddy's building blocks and directly editing the regex pattern to suit your own skill and style. Rely on RegexBuddy as you rely on a buddy or coach to assist you. Once you created a regular expression, test it on sample data, store it for later reuse, and send it to the application you are working with. You can document your own regular expressions in the same way. Just click the Export button in RegexBuddy, and select the HTML format.